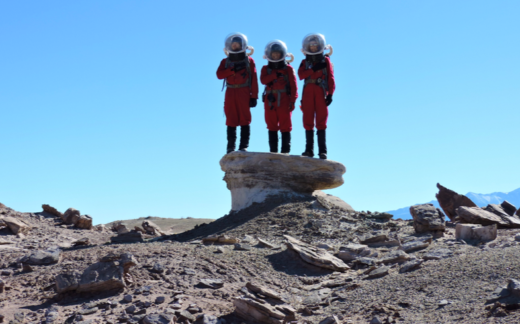 Join Sian Proctor, Angelo Vermeulen, and Sarah Jane Pell, participants in the HI-SEAS and MDRS Mars simulation missions. These simulation “astronauts” live for months in isolation in order to study how to handle the human and interpersonal side of an eventual mission to Mars. Sian studied the particular importance of meal time, and her Meals on Mars videos can be seen in the large dome. Angelo, HI-SEAS mission commander, studies starship design and is founder of SEAD. Sarah Jane Pell, from the MDRS mission, will show her unforgettable 360-dome film about the mock “Mars Olympiad” as well as a short Virtual Reality piece made during the MDRS mission. All three simulation astronauts will speak about their experiences, and what it will really take in order for humans to voyage to another world.